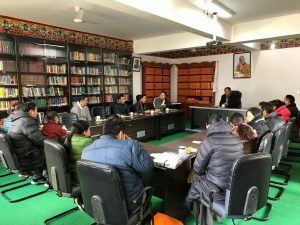 Dharamsala: On 24 January at around 11 AM, Tibetan Parliament-in-Exile hosted a modest farewell to Mrs. Khando Yangkyi on her transfer from Tibetan Parliamentary Secretariat to Tibetan Public Service Commission. Speaker Pema Jungney, on behalf of both the members of Tibetan Parliament-in-Exile and the staff of Parliamentary Secretariat expressed gratitude for her sincerity and dedication for the past 15 years’ service. He also presented her a ceremonial scarf and a small memento. 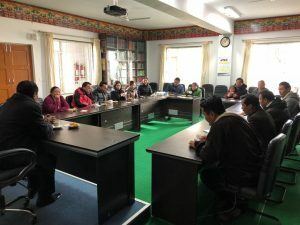 Mrs. Khando Yangkyi joined the Tibetan Parliamentary Secretariat on 18 June, 2003 as a staff and has contributed at the Parliamentary Secretariat for 15 years. She will join Tibetan Public Service Commission soon as a staff.